Regular Roadside Market Hours begin late this month, but you can always contact us to stop by and say hello. 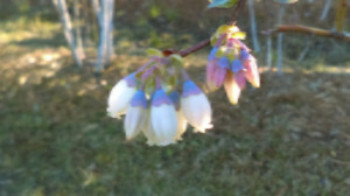 Blueberries blooming at the farm, bees flying madly stuffed with pollen for feeding the hive, and everything turning green from our pine pollen showers means it is spring for sure. You can finish up your blueberry maintenance by removing dead canes and skinny short ones, and we recommend a light feeding of a mild fertilizer now and when your fruit sets. If you or your family want to learn more about honey bees and how to keep them healthy and happy, we will be at Magnolia Plantation's 2017 Heirloom Plant Symposium on Saturday, March 11, at 9 am to talk about bees and their world. We will be following up with a Beginning Beekeeping Workshop at Magnolia Plantation Saturday, March 18, 9-12 pm. Please register in advance to attend. Free garden admission with both events, and you can stock up on your favorite Blue Pearl Farms honey, skins solutions and blueberry sauces on the 11th. 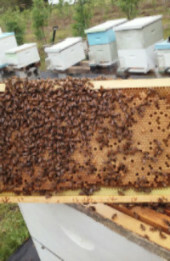 It's time for spring bee colony inspections, mite counts and treatments, and checking hive health. The beekeepers logbook for the Lowcountry can help you keep a look out for what to expect. For personalized visits to our apiary, contact us at info@bluepearlfarms.com. Our farmers markets begin the first week in April, with a few special events noted on the calendar to the left. We are working with volunteers all month to get the final spring tasks complete...come out for a few hours and go home with some farm treats and experiences. Call 843-887-3554 or email info@bluepearlfarms.com to find out more.